What’s Your Dream for the New High School? That’s what Spryfield Community Association is asking local folks. Nova Scotia needs to be budget-conscious, which means our new school ought to serve several functions, such as a rooftop garden or mental health services, for example. We believe that people affected by decisions should be involved in making the decisions. We want to bring the community together to create our school together. That means bringing lots of different viewpoints into conversations about how our new high school can benefit the whole community, and what the community can do for the school. We will be casting a wide net to hear from many different people, such as students and teachers; parent groups and family resource centres; local businesses and organizations; and long-time residents and newcomers. Come and have a say at our community meeting on Wednesday, October 24, 7:00 pm at Captain William Spry Community Centre. The Association thinks it is important that the provincial government hear from the community early on in the planning process, and make sure that community involvement doesn’t get left until after major decisions have been made about our school. Spryfield and area needs to have a strong voice in matters affecting our daily lives. Spryfield Community Association helps to strengthen that voice. Keep an eye on this page for updates and a compendium of answers to the question: what’s your dream for the new high school? 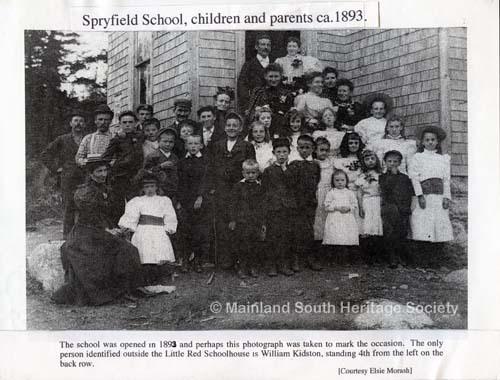 Some Spryfielders meeting about the school in 1893. Photo courtesy Mainland South Historical Society. Previous: Previous post: Amazing Chicken Alert Issued!